Bangkok is one of the most popular tourist cities in the world. The Grand Palace, Wat Phra Kaew, and Chatuchak weekend market are just a few of the attractions that nearly every visitor has on their bucket list. However, there are also many other Bangkok attractions that are not so well known, yet equally spectacular. 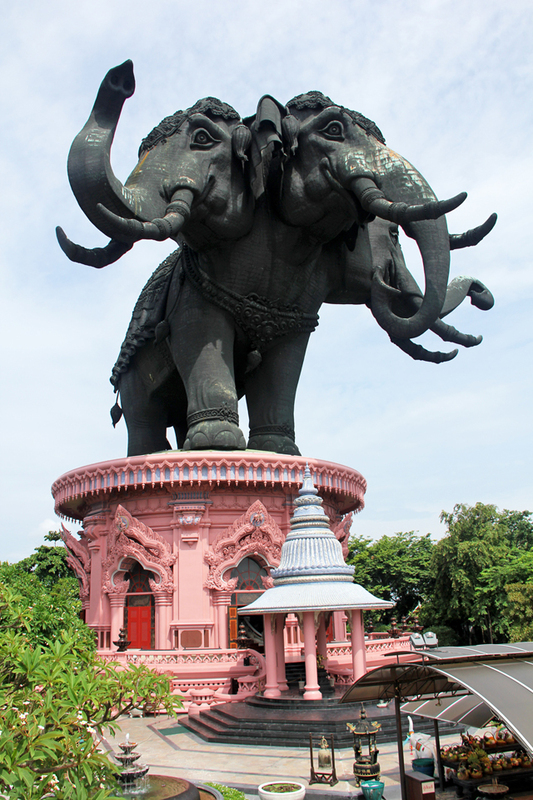 Located just outside the border of Bangkok in a province called Samut Prakan, is the 3 headed elephant Erawan Museum, one of my favorite sites in the city. Approaching the monument you'll see the humongous sculpture, proudly towering over the highway and shimmering in the Bangkok sunshine. Khun Lek, the private commissioner of the project, built the Erawan Museum as a facility to house his collection of religious relics and art; He also wanted to preserve Thai cultural heritage by showcasing a few of the sacred objects he had accumulated over the years. After much thought, Khun Lek finally decided to construct a three headed elephant, influenced by Airavata (known as Erawan in Thai) – a mythical elephant in Hinduism. After paying the entrance fee, you enter the compound where there's first a Buddhist shrine. At the base of the elephant structure is the main part of the museum where you can enjoy a short tour before heading upstairs to the sanctuary section of the museum. Inside, the decorations are so elaborate, it almost feels like you've been transported to a fantasy playground reminiscent of Narnia. At the top of the building (which happens to be right below the section where the elephant actually starts), is a large stained glass overhead dome – something that's not common to see in Thailand. The interior is extremely colorful and includes an array of artistic cultural works of art. But the highlight of visiting the Erawan Museum is getting the chance to finally go into the head of the elephant. You can either choose to take the elevator, or climb the circular staircase to the top. Once you're at the top, the room opens into what feels like a cavern. 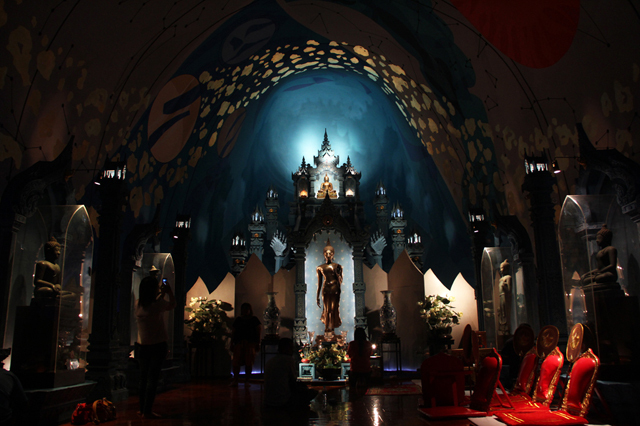 The darkness is broken by blue lighting, and red royal chairs lead to the front where a golden statue of Buddha stands. After wandering around the inside, the next part of visiting the Erawan Museum are the beautiful tropical gardens that surround. 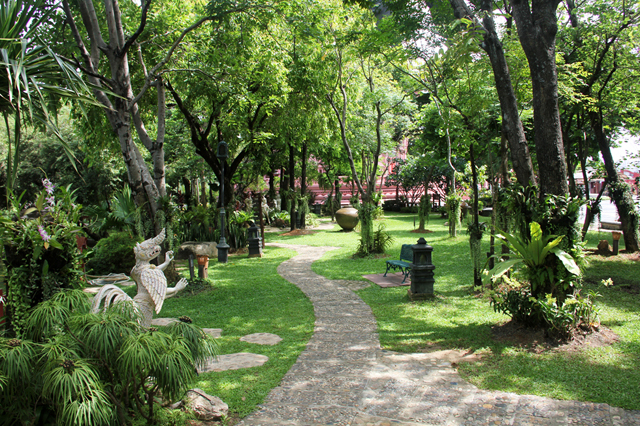 Along the small pathways that lead through the lush plants and trees, are a series of Thai sculptures, benches, and covered pagodas if you'd like to relax. While the Erawan Museum doesn't have the cultural or historical significance that some of the other temples and palaces in Bangkok do, in my opinion it is still one of the most breathtaking man-made structures in town – and few tourists visit. The biggest downside is the 300 baht (around $10) entrance fee, which is quite expensive when compared to the cost of traveling in Bangkok. However, if you are visiting Bangkok and looking for a spectacular attraction that's off the beaten track of “top-10's,” I would highly recommend a visit to the Erawan Museum.